Loop and pull through, loop and pull through. This has been my life for hours on end since January. I learned how to crochet in late December from a friend. I had been feeling like I wanted to do something, to create something. I had a good amount of time off for Christmas and New Years so I was getting enough sleep and taking a break, which always gets the creativity flowing. I start to feel it as ideas popped up like bubbles, but instead of breaking, they took residence in the inner corners of my brain. I feel it in my hands as if it is the absence of something. Something I should be doing, making, moving, trying. So I tried knitting. And it was more difficult than I was looking for and I tried crochet and it made perfect sense. I was on a flight in January working on my first project and a boy across the aisle took out two of the biggest knitting needles I've ever seen (yes, they're allowed in carry-ons) and pulled out some beautiful brown yarn. He explained that he was making an infinity scarf for his girlfriend. I told him that I had just learned to crochet. He said "I tried to crochet, but man it was hard. That's why I'm knitting." I love how our brains are all different and that I may have this cog here and he has that wheel there and that's why knitting comes easy to him and crochet comes easy to me. 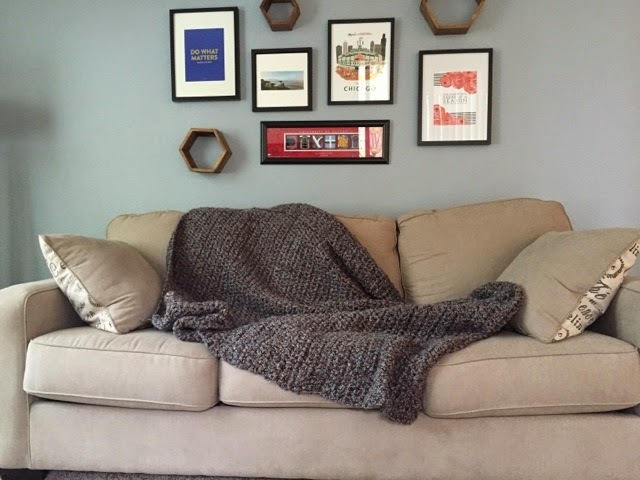 When I learned to crochet, I knew instantly I wanted an afghan. Something that I could cover up with and keep warm with. Keep in mind that this was during the Chicago winter so that made a lot more sense then than now. Luckily I took up crochet just as the craft stores were having their after Christmas sale so I picked up this blue and tan chunky yarn. When I got home, I did the entire skein and realized I was going to need about 12 more to get the length and size I wanted. I spent almost every night in January looping and double crocheting my way through the blanket. One Saturday I made a ton of progress and then laid it out on my bed to look at it and realized that I had been losing a stitch in every row. My square blanket was becoming a triangle. I cried, mad at myself. As I pulled out every stitch for 10 rows, my heart physically hurt. But that's what creativity is right? It's heart and whenever the heart is involved, emotion is right there with it. It's gaining from the highest highs and also gaining from the lowest lows. Art gathers up everything you bring to the table and says "Let's work with what you got." At that time it was a lot of hurt from a long-distance relationship and a job I didn't love and my creativity said "You need some comfort. Something warm and soft. Something to shelter you from the cold winds and remind you of the warmth that is inside you." So after I took out those 10 rows, I put the blanket away so I that I could come to it anew the next morning. There was a long break I took from the blanket, a time filled with warmth and excitement. I got a new job and I drove everything out to California. Once I got everything unpacked and set out, I started to feel it again. My hands were itching to make something that didn't involve a keyboard. There was only 3 more skeins left. I didn't think I needed the same comfort, but a different one. I needed the comfort that it was done and is always waiting for me when I need it. So I looped and pulled through and looped some more every night for a few week. It felt silly working on it while it was warm outside, but one night I finally finished. I laid it out on the floor and noticed all the little loops and big loops and every so often, a missing stitch. It's not perfect, but nothing made by anyone else than God is. I have the blanket folded up and sitting on my couch. Everyone thinks that California is always warm and while there is a lot of sun, the mornings are cool as the fog breathes it's way back to the bay. My company is global so I'm usually on my email by 7am, tea in hand and blanket wrapped around my legs. It's comfy and warm and even though I finished it here, it reminds me of home. About the time it was cold and dark and how I got out of that to where it may not always be warm, but it's almost always light.